When you hire a car with Gray´s Car Rental you can rest assured that all our cars are fully legal and insured, please ensure that you have your passport and driving licence upon collection of the vehicle. There are no hidden fees with Gray´s Car Rental and we pride ourselves on offering a stress free service. All drivers must be over the age of 21. To drive a Gray´s Car Rental vehicle you must provide at the time of hire, an original full driving license, passport and rental agreement of the property you will be residing in whilst in Spain. You have the option to pay your rent a car balance in full at booking via bank transfer or alternatively full balance can be paid on collection of vehicle. A refundable security deposit of €100 is required when collecting the vehicle, this will be returned once the car is checked. Hire includes: Third party car hire cover with excess of the cost of the hire car. In the event of an accident/damage the hirer is liable for the full cost of any damage to the hire car only. All other parties are covered. Any traffic violations or parking offences or any breach of laws, rules or local regulations will be paid in full by the hirer plus an additional €25 administration fee. The hirer is fully responsible of the value of the vehicle if it is found that the driver is involved in any kind of any incident or accident and is above the legal limits. In the unlikely event of a breakdown, please contact our 24 hour emergency breakdown cover (0034) 902 151 015 (0034) 902 100 570. In the event of an accident you have to notify Gray´s Car Rental immediately on our contact number (0034) 694 493 059. You must take full details of all parties involved. 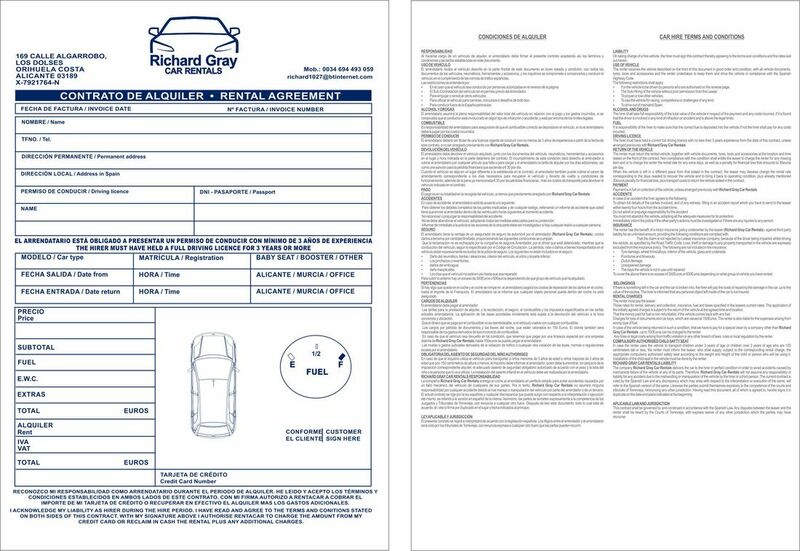 Complete the accident form which is provided in the glove box of the vehicle (without completion of this form a claim cannot be made). Do not admit or accept responsibility for the accident unless you are 100% sure and understand everything that you are signing. Do not abandon the vehicle, Inform the police immediately of accident details or any injuries, police can be contacted on 112. 1. Any damage to tyre or wheels are at the expense of the renter do not remove rental agreements or official documents from the vehicle. 3. If the vehicle is not returned in a reasonable condition as it was collected, the renter will be charged for a full valet of 50€ and any additional repairs will be charged accordingly. Our fuel policy is that you receive the vehicle with a full tank and you are required to return the vehicle with a full tank. If the car is not returned with a full tank, the hirer is responsible for the cost of refuelling the car plus an administration fee of 25€. All traffic fines will be charged to the hirer including a 25€ administration fee. Multi-trip policy - take as many as you want! Towing and Breakdown cover included as standard!